I had been in New Mexico for three days, 19 hours and 27 minutes and had yet to eat a chile relleno. But on day four, destiny called. 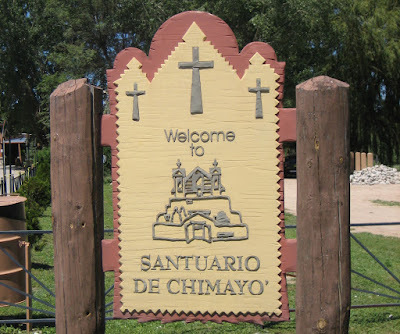 My aunt and I were off to Taos, and our first stop was the town of Chimayó. 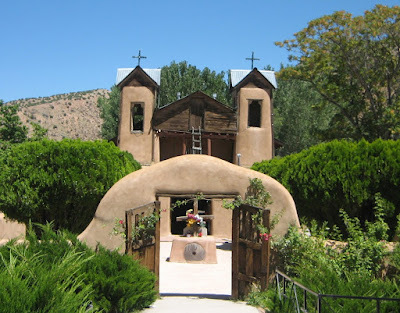 This tiny village in the Sangre de Cristo Mountains on the high road to Taos is known for two things—the best chiles in the country and an old sanctuary purported to have healing powers. In fact, so many pilgrims walk to El Santuario de Chimayó each year, it’s referred to as the Lourdes of America. If you ask me, you’d have a better chance of being healed by the chiles, with all their vitamin C. But that’s not as romantic as a chapel full of holy dirt and crutches that were supposedly left behind by those who were miraculously cured. Call me a spiritual killjoy, but I’m standing by my chile theory. The legendary Chimayó chile is a Native American heirloom strain that’s been growing for about 400 years solely in Northern New Mexico. It has a distinct pottery red-orange color and a deep, robust flavor that’s superior to the hybrid commodity chile grown in Southern New Mexico, like Hatch and Socorro. Its supremacy is due to the region’s optimal growing conditions and the chile’s natural adaptation to it, which has created a more disease-resistant crop and can grow without fertilizers. Since Chimayó chile powder sells for about $20 for four ounces, big agribusiness and identity thieves are hot to brand their chiles as Chimayó. Hence, they genetically modify crops and engineer flavors, which threaten the survival of the native seed strains. The Chimayó chile was nearly extinct a few years ago since only a handful of farmers were still growing it. Then a consortium of farmers and activists started the Chimayó Chile Project to protect the native crop and the farmers’ intellectual property. They started with seed preservation and then began working with the local farmers. In 2006, the Native Hispanic Institute helped provide the farmers with legal and technical assistance so they could incorporate and apply for the trade name Chimayó. Today it’s a registered mark owned by Chimayó Chile Farmers, Inc.
We stopped in a little store (above) called El Potrero Trading Post to buy some chile powder. They told me they didn't have the real Chimayó heirloom variety since it was only available for two months, in October and November. They assured me, however, that the quality of the type I got was very close. It was so fresh and fragrant—far superior to any chile powder I’d ever smelled. How could the real stuff be that much better? It was finally time for our highly anticipated lunch at the Rancho de Chimayó, a charming restaurant in a century-old adobe hacienda surrounded by three mountain ranges. Our sunny patio table overlooking the handsome terrain and azure sky was a vivid setting for my moment of truth. Would this be the life-affirming chile relleno I'd been waiting for or would I give it all up to become a culinary nun? Would a case of sour grapes lead me down a dark, eat-to-live path devoid of all decadence and rapture? As the first bite of relleno kissed my lips, I heard a ringing in my ears: Hal-uh-loo-ya. 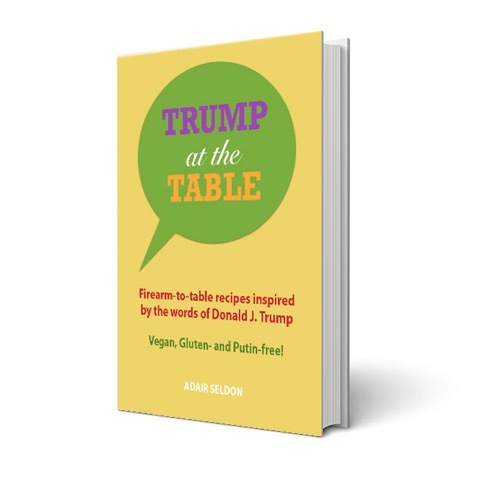 As it gracefully slid off the fork and onto my tongue, my mouth heard it too: Hal-uh-loo-ya. Hal-uh-loooooo-ya. Hal-uh-loooooo-oooooo-ya! That green chile was so fresh, it was practically still on the vine. I was convinced that whoever had the divine vision in 16th- century Mexico to take a fresh green chile and roast it, stuff it with cheese, dredge it in an egg batter, fry it to golden-hued perfection and top it with fresh, chopped tomatoes should have a sanctuary built in his or her honor. And whoever had the vision in 21st-century New Mexico to serve it with Spanish rice, white posole and fresh sopapillas for $7.25 deserved some kind of shrine. I was cured. I was a believer. And it was well worth the pilgrimage. I'm so glad you found your edible nirvana. I've been on pins and needles since your last post. There's nothing like having a greatly anticipated meal turn out to be more than you hoped for. Good for you. Very interesting chile info. Thanks! That sounds absolutely amazing. I'm glad it was as delicious as anticipated! OK, now I am OFFICIALLY jealous! I want one, right now. So, you will be bringing this dish to a future FBLA meeting? Dorothy: I doubt I have the chile relleno touch (I don't do deep-fried), although I already made some blue posole I brought back and cooked it in some of that vibrant chile powder. Great information and you know I'm a long, quick-drive to Santa Fe. Will have to hunt me down some Chimayo chiles. Thanks for all the details about the Chimayo Chile Project. Okay, I'm Korean, so I LOVE my chilies. I'm not so knowledgable abt Latino ones though. I'm so glad you had such a wonderful meal there, though. It's definitely got me anticipating! I'm hoping to visit New Mexico someday, maybe even this winter. Fingers crossed! If you pass back through Santa Fe, "Dave's Not Here" has incredible New Mexican style chilie rellenos. I've eaten at Rancho de Chimayo once (best carne adovada I've had), but didn't try their rellenos. I'll bet they were good! I'd have to have red chilie though. Strange that we don't have anyplace local to get true northern New Mexican food. The only places I know of are Zia's in Santa Barbara and Anita's in Fullerton, but didn't find the real flavors and textures (and tried rellenos at both). Man, this post makes me wish I stilled lived in N.M. The chile rellenos in Indiana are an abomination: flavorless poblanos stuffed with flavorless plastic cheese. Bleh.